The book2net profi-V is one of the most successful and versatile book scanners on the international market and convinces users by its high quality, productivity and reliability. (paperbacks, journals, … etc. ), or even historical stock, this solution offers special advantages. The separate height adjustment of the right and left side guarantees an optimal adaptation of the support surface and allows a significant increase in quality. 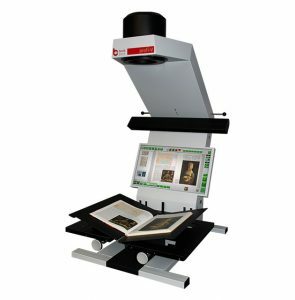 The adjustable book spine exemption, center alignment and optional glass plates for 180° or V-shape operation are adding crucial features to provide a gentle as well as efficient scanning system.